This is a free event open to the public. Please register so that we know how many to expect and can set up accordingly. 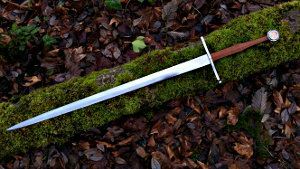 Nathan Abell will talk about his experience learning to make European style swords as an amateur, using stock removal techniques and limited tools. Bring your questions. This is an informal talk with time for Q&A. Free to All, Public Warmly Welcome Tech Talks are free and open to the public. Registration is requested but not required. It's just so we can do a better job of setting up. Share a link to this talk with someone who might be interested. Mark your calendar for the second Sunday of each month when ETA holds a free tech talk. Topics are wide-ranging by design. Free for members and non-members. Contact eta.lead@bainbridgebarn.org to volunteer for a future talk or to share your ideas for an interesting topic. April Tech Talk: No tech talk in April. Instead, we'll be open for Sunday Sampler, a BARN-wide event.